If you are looking for an affordable starter home that is fully equipped with home features, a ranch style modular home may be the way to go. This home style is the most preferred design for many homeowners who want to build a beautiful starter home with a starter budget. This might be a simple floor plan but it has the right features that a small family can enjoy. The perfect ranch style floor plan is the Roosevelt style ranch home. 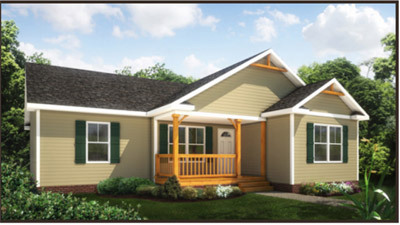 The Roosevelt Ranch Style Modular Home has 3 bedrooms and 2 bathrooms in a 1,547 sq. ft. floor plan. It features one master bedroom with a dedicated bathroom while the other two bedrooms share a common bathroom which is also accessible from the kitchen and the living room. This floor plan can be further modified to meet the homeowner's needs. The Roosevelt Ranch Style Home is the perfect home for newlyweds, for smaller families or for those who want to downsize. For more details about this modular floor plan, contact Tidewater Custom Modular Homes. For newly wedded couples, buying a house of their own is often a major goal. However, traditionally constructing a home can take time and budgets can fluctuate throughout the process. However, modular home construction offers more affordable, consistent budgets for gorgeous, custom homes built in less time. As a matter of fact, modular Homes in Newport News, VA are built with cutting-edge building technology and streamlined procedures. Consequently, new couples can build the beautiful high-end homes they deserve by choosing to custom-build with modular construction. With wide array of selections for designs and floorplans, there's always a modular floor plan that can be customized to meet the specific needs and budget. In fact, newly married couples can actually begin with a smaller, stunning and custom home. As the family grows, they can expand the house and add more space through a modular home addition. With the modular building system, home renovations are easier and faster to carry out. To learn more about modular homes, contact Tidewater Custom Modular Homes. There are a lot of reasons and benefits for staying in your existing home rather than moving. However, when the need for a larger space arises, homeowners often think that jumping into the housing market is their homes only option. Too often home additions are not a consideration because of time, stress and cost. Modular home additions offer a fast and affordable solution for home expansion, even if the original home was built through traditional stick built construction. Since the modules for home additions are built off-site, this guarantees that there is no interruption in work. This means the agreed upon time-frame for delivery will be met. Site work is being done at the same time that the addition is being built, which cuts the project time down significantly. When these projects are built in a factory setting and completed in a timely manner, labor costs are constant. Moreover, modular construction allows for unique customization of designs. Homeowners can specify their preferences and the modular home builders make these plans materialized. The Modular building system offers limitless possibilities for modular floor plans. Now, homeowners can increase the living space of their homes without the hassle of stick built construction. If you are planning a home addition through modular technology, contact Tidewater Custom Modular Homes. Contrary to popular belief, modular homes are not limited to cookie-cutter design. In fact, you can build luxury houses and grand bungalows with unique designs through modular building system. The only element it requires, is to think outside the box and look for the best modular home builder in your area. As a matter of fact, modular homes offer a large selection of luxury home designs which can be further modified to suit the style of the homeowner. Modular floor plans can be uniquely customized to create a more functional arrangement that meets the specific needs of the owner. Modular home construction strictly follows the floor plan to the exact specifications laid out in the design stage. The precision of the project is made possible with advanced building technology used in designing and fabricating the modules. The advantage in building luxury modular homes through this process is that the budget and time to completion will never change as the building project gets started. Once the plan is created and approved, and total construction cost are computed, expect no additional surprise expenses or time delays with modular construction. For more information, contact Tidewater Custom Modular Homes. As more people become interested in the idea of the modular building method, choosing the right modular home builders and manufacturers is crucial. If you have decided to build your new home through modular construction, it is imperative to choose a modular manufacturer with an established reputation. Building a new home will be your biggest investment. Homeowners must scrutinize the work of a the modular home manufacturer prior to choosing to work with them. By viewing model homes and portfolios as well as checking client reviews, homeowners can have the information they need on the modular home company before they begin the planning and construction phase. For homeowners, this ensures that their modular homes is precisely and gorgeously built the way they want it done. Modular building systems are a more efficient and effective way to build a home. At Tidewater Custom Modular Homes, we make sure our clients are provided with substantial information and facts regarding our building process prior to the start of any construction. We also aid clients who need construction financing and offer them options that best suit their needs. Contact us today for more information! Home renovations through traditional construction can be expensive in both time and money. When you try to add space to your home the overall renovation cost overruns can really add up. This is due to high labor costs, labor and materials shortages and poor initial planning. Fortunately, modular home additions have paved the way for faster and more affordable home renovations. Now, homeowners can economically and in less time add space to their homes without compromising quality of materials and craftsmanship. Because modular building systems uses advanced computer software, the exact home modifications that homeowners desire can be precisely achieved. Moreover, because the overall home improvement estimates can be computed accurately, surprise cost overruns are eliminated when using modular construction. Indeed, modular building systems have given homeowners an opportunity for home expansion and enhancement. Today, customized home additions are within reach. Contact Tidewater Custom Modular Homes to discuss your home renovation plans and options. Modular homes are constructed using a building system. Advanced technology is used to design the framework and floor plans using the latest methods of construction technology to create a sturdier, customized structure. The modules are pre-fabricated in indoor, climate controlled facilities and quality control standards are closely monitored. By the time the modules are completed they have gone through multiple QA checks throughout the entire building process. The modules are then shipped to the permanent building site and assembled meaning far less time to completion than with traditional construction. Although homebuyers often have questions concerning the strength, sturdiness, and aesthetics of modular homes due to the speedy construction, they quickly learning that modular construction is a method that is becoming more and more popular for exactly all of those qualities. Modular construction exceeds the standards and codes of the more conventional building process throughout each phase and are subject to rigorous quality inspections prior to proceeding to the next step. This is something that traditional construction does not have in place. Moreover, modular homes in Williamsburg, VA comply with HUD building codes. This entails modular homes to meet all construction laws and regulations that have been implemented by the federal government to protect home buyers and consumers. If you are interested in modular homes, contact Tidewater Custom Modular Homes for more details. The main consideration in building a home after aesthetics is safety. Your family will be moving into your new home and you need to make sure it can weather any type of storm that can hit Virginia. With Modular Construction, settling for low-quality materials is not part of the process. If you are looking for the best way to build a home, with quality assurance guaranteed, then consider modular construction for a quality home that is within your budget. Modular homes in Suffolk, VA meet or exceed all state and local building codes. They are safe and sturdy because they are made from high-quality materials with exceptional craftsmanship. During the building process, they undergo multiple strict quality inspections prior to actual assembly on-site. Precision cut materials are built into modules which are then fit and fastened to withstand transportation and craning. Glued and screwed sheathing and decking is applied to modular homes with extra framing support that make them tough to withstand nature's assault. Additionally, higher safety standards that conform to federal laws are applied to the modular building process. Your home will be fully-equipped with smoke detectors, regulation windows, and non-combustible materials around furnaces and kitchen ranges. The faster construction process and effective use of resources makes modular homes more affordable over conventionally built homes. Contact Tidewater Custom Modular Homes for a safe, attractive and affordable home. Modular homes allow you to afford the home that you want with all the options you are looking for. You can have a basement, multi-levels, extra bedrooms, increased energy efficiency and insulation. Tidewater Custom Modular Homes allows you to choose different custom options so you no longer have to settle for a cookie cutter house. You can enjoy your dream home, now possible through the efficiency of modular construction. Modular homes look just like traditional stick built homes. The big difference is that they are pre-built in factories and assembled on-site. This provides time savings since construction on the modular building can begin in the factory while the foundation and site work is being done at the work site. But don’t just listen to us, take a look at our beautiful gallery of homes to see for yourself. Your modular home floor plan can be customized to meet your dreams. For more information, contact Tidewater Custom Modular Homes. You want a newly built home, but you don’t want to wait up to a year to move in and you want your new home customized. Build a modular home which takes significantly less time, and can be highly customized. Prior to building process, you will meet with the modular home builder to discuss floor plans and budgets. There are many different home styles and floor plans that you can consider when you are building a new modular home. Your options are unlimited, from colonials to ranch homes to Cape Cod style, and each style home has their own individual flare. You have the option of a standard floor plan with customizations in various rooms or you can have your floor plan customized however you would like. In the kitchen an island or under cabinet lighting can be added, or perhaps twelve foot ceilings, recessed lightning and crown molding . How about transoms and side lights at the front door? Perhaps you are interested in a media center; Tidewater Custom Modular Homes can add surround sound to the family room, with an area in the wall for a recessed television. You also have the ability to choose cabinet styles and finishes, hard wood flooring and recessed lighting. There are so many special features to add to your new modular home, inside and out. And, the process takes weeks instead of months, sooner rather than later you are moving into your new, custom built modular home. For more information contact Tidewater Custom Modular Homes.